& woods bow down to clear a way for thee "
It should have been no surprise that the Green Party lost more than half of its 2015 vote at the recent general election. A re-invigorated Labour Party, led by a veteran socialist and enthused by a huge influx of new and returning radicals, including many from the Green Party, fought an effective grassroots campaign, against a smug and inept Tory Party, in a polarised election. The bad news was that the Green Party failed to build on progress made. It seems a long way from increasing its parliamentary representation if it has to fight all the other parties under first past the post. The good news was that for the first time a Labour Party which challenged neo liberalism and austerity came close to victory, and is confident of becoming at least the largest party in a further general election which may be coming soon. Greens played an important part in Labour's relative success. Some local green parties, including my own in High Peak, stood candidates down and encouraged our supporters to lend their votes to Labour. Everywhere many who voted Green in 2015 because of its left wing policies cast their votes for Jeremy and his team this time, contributing to a Labour vote of 40%, which rocked the establishment and shocked many of the so-called experts. What should greens do? Cry foul play because Labour wouldn't play ball over electoral alliances and stole some of our popular policies? Wait ( even hope ) for Corbyn and Co to run out of momentum and for their new radical supporters to become disillusioned, in the hopes that some of them will drift back to us? I fear many will simply disengage. Having nothing to do with the Labour Party may be considered the route to success in the 'long term' , but, seriously, how long have we got ? Central to our politics is a belief that we need a government which will take action on climate change and much else in the very near future. It would be far better to positively engage with the Labour Party and its huge membership. We should campaign with them on issues where we share common aims - investing in social housing and public services, reducing the obscene division of wealth in the UK and across the planet, defending environmental protections and workers’ rights in the context of Brexit etc . Whilst doing so we can seek to convince Labour members and supporters that the ecological agenda needs to have as much prominence as the economic and social . In my experience many of them already understand this and would welcome the opportunity to work with Greens. We need to build a popular movement not just for socialism but for ecosocialism. We also need to continue to promote a new politics, based on progressive alliances and fixing our broken system, including introducing PR. As Caroline Lucas said after the 2015 election.
" unless we work out a way of working together then the grounds for radical hope will be much diminished"
This article is written from the perspective of one who has been tested multiple times to ensure entitlement for the out-of-waged work sickness and disability benefit ESA (Employment & Support Allowance), and campaigned with and blogged for the Kilburn Unemployed Workers Group's 'Kwug Blog'. (1) It seems to me that there are huge differences between the sort of evidence-base required to prove one's eligibility for a Department for Work & Pensions State benefit compared to what is required to influence DWP policy affecting economically vulnerable claimants. For some time now Venezuela has had an appalling media image: repression (with over 100 deaths in the last four months), opposition leaders in gaol, dismissal of the Attorney-General, in short, a dictatorship. A major oil producer, it is also seen as anything but Green. But the very fact of Venezuela’s enormous oil wealth (its reserves are now estimated to be the world’s largest) and its deposits of coal, gold, alumina and other minerals make it a coveted prize for global capital and the US. Add to this its central role since 1999 in the emergence of a regional anti-imperialist and revolutionary alliance which poses a direct threat to corporate globalisation and US hegemony, and you can see why it is a prime target for media distortion, political hostility and destabilisation. In a region where the Cuban and Nicaraguan revolutions had inspired hope of liberation and social justice through armed insurrection, such visions had been crushed by military regimes which used the guerrilla threat as a pretext for brutal repression. But with Hugo Chávez and the “Bolivarian Revolution” the Venezuelans turned this logic on its head: yes, they said, we believe in peaceful change and democracy, but revolutionary democracy, participatory democracy in which ordinary people – workers, peasants, women, blacks and native peoples – organise to vote in elections, referenda, community councils and communes to show that “Another World Is Possible”. The extraordinary success of this process, leading to dramatic improvements in health, education, welfare, housing, and rights for women, workers and minorities, guaranteed electoral victories for the revolution in all except two of twenty elections and referenda over the past 18 years. It also led to remarkable economic success for many years. But not surprisingly it met with ferocious hostility from Washington and the privileged Venezuelan oligarchy. Unable to win elections, the oligarchy seized power by force in the April 2002 coup, but was driven out in less than 48 hours by mass resistance and because the military, inspired and reorganised by Chávez, were being radically transformed into a people’s army identified with the revolution. Venezuela’s transformation, supported from the beginning by Cuba, now gave rise to a broader Latin American liberation project conceived by Chávez: the ALBA or Bolivarian Alliance for the Peoples of Our America. Not a “Free Trade Deal”, in fact its polar opposite, the ALBA is an economic, social, political and cultural integration project based on fair trade, social justice and environmental sustainability. It includes Venezuela, Cuba, Bolivia, Nicaragua, Ecuador and four of the small Anglophone Caribbean states. Honduras and Paraguay also joined but then left following right-wing coups inspired by Washington, but other small Caribbean countries have since joined. Two regional giants, Brazil and Argentina, also allied with Venezuela without becoming members of ALBA, and the Alliance also promoted cooperation between non-state actors such as social movements in different countries. The influence of indigenous movements and of the Bolivian government have led to increased emphasis on Pachamama – Mother Earth – and to ALBA playing a leading role in global climate negotiations. Bolivarian Venezuela has also promoted less overtly political instruments of regional integration, notably UNASUR (the Union of South American States) and CELAC (the Confederation of Latin American and Caribbean States), in contrast to the older OAS (Organisation of American States) which has been described as “the US Department of Colonies”. Other institutions promoted by Venezuela include PETROCARIBE, the Bank of the South, the University of the South and the multinational Latin TV channel Telesur. In sum these amount to an entire regional architecture asserting sovereignty and independence from the Colossus of the North. It is in these circumstances that a global right-wing offensive, led by Washington but backed also by the UK and EU, has been trying to roll back all of the gains made by ALBA and the broader Latin American liberation project. The right-wing electoral victory of Macri in Argentina and the coup against Dilma Rousseff in Brazil paved the way for an all-out offensive against Venezuela, rightly seen as the key to the entire regional liberation project. Of course there have been mistakes and deficiencies in the Venezuelan process and the government of President Nicolás Maduro. But Maduro has a democratic mandate and has repeatedly tried to negotiate with the opposition which is intransigent and violent. The recent decision to convene a Constituent Assembly appears to have been a master-stroke: it mobilised the popular base of the revolution as never before since the death of Chávez, and it is no accident that opposition violence has ceased since the Assembly elections. The media will not tell you that 70% of the 100+ violent deaths in the previous four months were caused by the opposition, a significant section of which is armed and very violent: they have shot police and troops, thrown Molotov cocktails, set fire to government buildings and buses, and lynched unarmed government supporters, particularly those who are black or indigenous. Sectors of the opposition are openly fascist, and prominent opposition leaders who are in gaol are there for having openly incited such violence. 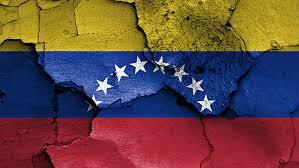 Now with Trump’s new sanctions designed to strangle Venezuela, there is only one side we can possibly support in this conflict; in fact, victory for Venezuela could well be a crucial step in restraining the genocidal and ecocidal offensive of global reaction. The General Election result was a shock, but there had been straws in the wind. Such as the campaign over school cuts led by parents, unions and community groups that became a mass movement during the election period. Survation, the most accurate polling company of GE2017 found that 7.8 million people changed their votes during the campaign for four main reasons: party leader, school funding, social care and Brexit. School funding was the second most common reason for vote change and the equivalent of 800,000 votes. The budget cuts were the result of the government’s revision of the national funding formula for distributing funds to local authorities and the additional pressures of a rise in national insurance and pensions contributions, the apprenticeship levy and rising pupil numbers. This meant that the amount per pupil was cut in real terms. 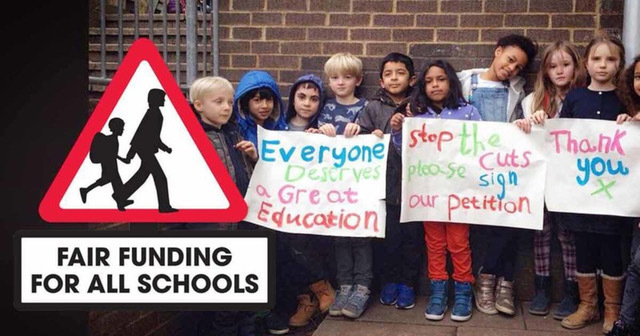 Government protested that funding had never been higher, but the Fair Funding For All Schools campaign definitively refuted this. There were a number of aspects of the campaign that were particularly effective. We could learn from this for other campaigns such as fracking, library closures and clean air. Vitally a direct link was made between the national figures on education cuts right down to school level and the number of jobs that were threatened. 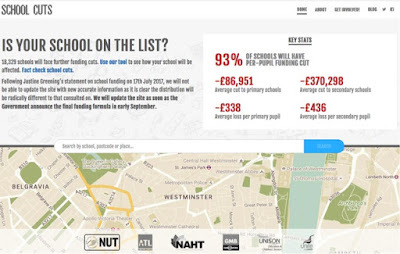 Using the schoolcuts.org.uk website parents, students, governors and teachers could type in the name of their school and find out exactly how much would be cut and its equivalent in jobs. The cuts could be seen as real flesh and blood people who would be lost to the school and the children. This galvanised groups of parents to organise at school and local level and created dialogue with school staff and education unions. The website added tools to directly email MPs and enable self-organisation of events to publicise the cuts. These were imaginative including picnics, marches, and choirs singing against the cuts all of which were posted on social media including YouTube. The NUT’s school cuts video on Facebook was watched by more than 4.5 million people and individual teachers and parents posted links to events on Twitter, Facebook and other social media. As the campaign progressed the press began to pick up the issue and Tory MPs faced with a deluge of email began to lobby their government colleagues about the cuts. Then Theresa May put her foot in it with the announcement that she wanted to end infant free meals, and replace them with free breakfasts. This mobilized some less visible people, such as school governors who had made financial investments in expanding school kitchens and taking on additional staff when free meals were introduced. Now they were they facing making staff redundant through budget cuts directly due to government policy. Now the National Education Union exists, made up of the amalgamation of the NUT and ATL. 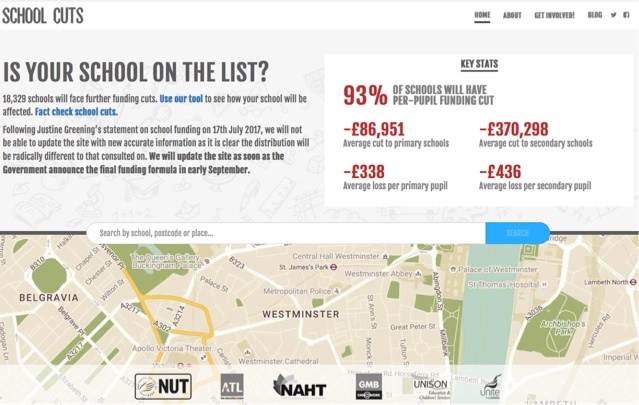 Cooperation between unions was a vital part of this campaign with the schools cuts website supported by the NUT, ATL, NAHT, GMB*, Unison and Unite. By the time you read this, the Government will have announced its school funding proposals. They failed to make a clear announcement in the Queen’s (over-testing) Speech, with only a fudged proposal on shifting funds from the free schools programme. What is needed is a restoration of funding to 2015 levels with additional funding in April 2018 to ensure an increase in real terms.Whatever the eventual outcome this campaign has created structures than can be built to transform education. I hope Green Party members if not involved already will get behind it. It was said of the 2015 Autumn conference that there was an elephant, if not in the room, at least staring in from the Bournemouth promenade. But it was business as usual on the conference floor with barely a mention of the event which had changed the political weather – the election of Jeremy Corbyn as Labour leader. 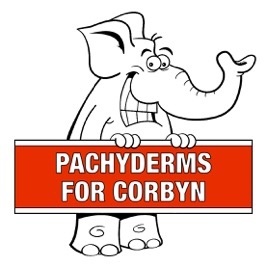 This Autumn`s conference has more motions on organisation and strategy than those on policy – so after all the confounding of pundits and pollsters, the winning of votes, parliamentary seats and leadership elections the presence of a large pachyderm has finally been acknowledged. The Green Party has long been strong on innovative policy ideas. The notion of a Citizens’ Income has entered mainstream thinking as a way of enabling billions of workers to consume goods produced by the technology which has displaced them. Even a motion on the principle of ecocide, passed at a recent conference, found an echo when some world leaders condemned Trump`s climate change walkout as “a crime against humanity”. We have spent less time considering how we get from where we are now to where we want to be. The Target to Win strategy did have its successes at local level. Chris Williams, one of 24 Green councillors elected in the West Midlands, told Green World “Our message does resonate in working class areas once we break out of the “comfort zone”, there is nothing special in the water here”. They campaigned with local organisations to defend services and alongside ordinary people on day to day issues. The party lost an opportunity when the strategy was not widely taken up. The success of the party`s anti-austerity stance at the 2015 General election was undermined by First Past the Post. After the dismal showing at the 2017 General Election everyone is asking “What now for the Green Party ? A question which will not be solved by improved training courses or organisational tinkering. However two motions do have proposals for the way forward.. This says that we need to get back to our core value. There are in fact 10 core values. They have quoted No.3 and managed to ignore No.1 which defines the Green Party as a party of social and environmental justice, the two elements being inseparable. It is proposed to emphasise the “ecological dimension” to all issues and produce “Talking Points” to help members to bring ecological themes into topics “not normally associated with them” and to stress “Abrupt Climate Change” which is now an emergency. A “Target Report” is also proposed to concentrate resources on seats where the Green vote held up in 2017. With the exception of Brighton these are all seats held by the Tories, mostly with a large majority. This motion, urges GPEW to prioritise campaigning on those issues, arising from climate change and other environmental threats, which amount to a health and safety emergency for the majority of people. Specifically a programme of measures to ensure Public Health and Safety which would increase funding for health and social care, fire safety in all homes and public buildings, low carbon public transport and renewable energy expansion and to help to build broad based local campaigns in support of these common interests. The motion recognises that the best hope for such action is the election of a Labour led government under pressure from a broad popular movement. This reference to Labour has not been popular in certain parts of the party although it merely states the obvious. After forcing May to abandon her election manifesto plans Labour is now setting the political agenda. Derek Wall has said that the Green Party paved the way for Corbyn`s victory by challenging the right wing consensus and now “a Green Party advancing new and radical ideas … challenging not so much Corbyn but the continuing rightward elements in Labour could play a very positive role”. The Green Party needs to keep its identity. It has been the vehicle for many ideas for change to benefit the 99%. No party can be the sole owner of an idea and to the extent that another party can actually implement green policies they deserve our backing. But for a Corbyn led government to deliver a radical social transformation it will need the support of a broad popular movement in which the Green Party can a play leading role. The proposers of Motion D08 say there is a “Climate Emergency”. Right. There has been one for decades. Ten years ago we marched from Heathrow to Sibson village, due to be bulldozed for the new runway, holding placards saying “Climate Emergency – Ban Domestic Flights !” I liked the slogan but would you use in an election campaign ? - not likely ! The media would inevitably ignore the “domestic” and depict us as killjoys who wanted to stop people going on holiday. A political party is more than a protest movement and the “make every theme green ” mantra of Motion D08 sounds like the latter. Stressing the danger of “Abrupt Climate Change” may scare people witless but what are they supposed to do ? Join the Greens ? Or stroll about with a sandwich board bearing that message so dear to cartoonists - “The End is Nigh” ? By ignoring the changed political landscape, Motion D08 is in danger of reducing GPEW to the proverbial one-trick pony; or worse, being seen as a sect shouting at the moon. Just before the 2017 general election campaign the Conservatives were predicted to win a landslide of over 100 under Theresa May, due to UKIP leaking support now that their wish of Britain leaving the European Union was going to be granted under a Conservative government. This prompted the Green Party to advocate a 'Progressive Alliance' between itself, Labour and the Liberal Democrats to throw the Conservatives out, on the grounds that the combined PA vote would be enough to oust them in key seats. The reality is that it failed for the Green Party, costing more than half its votes and all but 8 deposits. But PA was never going to work and made little or no difference to the outcome. Labour made as many as 29 gains from the Conservatives in 2017, but this was largely due to a backlash against Brexit in seats where Remain carried the vote in last year's EU referendum, long-term urban trends towards Labour, a poor Conservative campaign, and the Conservatives' frequent refusal to enter even local hustings. In the majority of these gains there was a Green candidate, and they often happened in seats where UKIP was tacitly supporting the Conservative MP in question. Of the six seats the Conservatives gained from Labour that year, four (Copeland, Mansfield, Middlesbrough South & East Cleveland, and Walsall North) had no Green Party candidate, and in the two with a Green candidate, North East Derbyshire and Stoke-on-Trent South, the Conservative majorities were larger than the number of Green votes attained in those seats in 2015, never mind 2017. A notable example is Peterborough, which Labour gained from Eurosceptic Conservative Stewart Jackson despite UKIP's support , and Mr Jackson increasing his vote share to 46.1%. Worse still, it gave the impression that the Green Party was tacitly supporting Labour and therefore not relevant to the big picture, which caused considerable damage to the Greens in Labour seats it had been targeting, and in many West Country seats where Labour was not in a position to win but where the Greens can win in the long run (e.g. Totnes, Somerton & Frome) firstreplacing the Liberal Democrats as challengers to the dominant Conservatives. Even before the Green Party leadership election of 2016, Labour publicly stated they would not support any such PAe, and the Liberal Democrats were largely uninterested as well. In fact, Labour infamously expelled three long-serving members who advocated Labour, like the Green Party, stand down for Dr Louise Irvine in South West Surrey in order to oust hated Health Secretary Jeremy Hunt. Labour made no reciprocation of any Green Party candidate withdrawals.The Liberal Democrats stood aside in Brighton Pavilion (Caroline Lucas' seat) and Skipton & Ripon, but this made no difference either as neither could realistically have changed hands. It is clear that the Progressive Alliance project, much vaunted by co-leaders Caroline Lucas and Jonathan Bartley, and also by deputy leader Amelia Womack, was a failure for the Green Party, and the Green Party must move on from it in order to achieve better electoral success and win more seats in future elections. It must also build a stronger councillor base, as groundwork is crucial for winning marginal seats and target seats and making sure the voters know what the green alternative can bring. The Green Party’s disappointing General Election June 2017 has been blamed on the failure of the ‘Progressive Alliance’ strategy, and the success of Jeremy Corbyn’s Labour Party moving leftwards and adopting many Green Party policies from our 2015 manifesto. Consequently some Green Party voices are now calling for a rightwards lurch by the Green Party, with the adoption of an ill-defined woolly ‘ecologism’ as our core message. The tired old mantra of ‘neither right, nor left, but forward’ has again raised its fatuous head, begging the question what constitutes forward? This would be a mistake. Our social justice policies – including education, NHS, railways and utilities into public ownership, student tuition fees and maintenance grants, mental health provision, links with trades unions on a host of workplace issues, must remain our lead messages, together with our key environmental policies including anti-fracking, opposition to nuclear power and nuclear weapons, renewable energy and many others. Our environmental and social justice policies are interdependent. Together they identify the Green Party. Opposing this vague ‘ecologism’ idea does not of course mean diluting our basic ecology principles. It is essential to draw a clear distinction between ecology and ‘ecologism’. Ecology is a biological science. It’s the study of ecosystems and the interconnectedness of all living things and their environment. All Green Party policies are evidence–based and consistent with the science. Our policies against global warming due to human activities are rooted in overwhelming scientific evidence. Green Party members are deeply concerned about pollution, contamination of habitats, degradation of oceans and rain forests, loss of biodiversity and endangered species. Many Greens, including myself, support groups such as Wildlife Trusts and the RSPB, engage in conservation activities and perhaps wildlife gardening, gaining a practical insight into local ecology issues. Ecology is not ecologism. Ecologism may be broadly defined as an ideology founded on the application of ecological concepts and priorities to political and moral issues. It has numerous varieties, including shallow, social and deep ecology. There are significant and valuable aspects of the various categories of ecologism, especially social ecology, but in general they fail to address adequately the fundamental origins of the environmental crisis, do not offer a radical solution, and do not represent a viable future direction for the Green Party. This is not about factional politics. It concerns open democratic policy / strategy debate and consensus. The current economic system, capitalism, and global corporatism are the central problems underlying the environmental crisis. Capitalism must be opposed and replaced by a new economic system. Ecologism does not confront and seek to end capitalism. Capitalism is predicated on continual growth which inevitably conflicts with the resources of a finite planet Earth. Ian Angus  in his discussion of the Anthropocene recognises capitalism’s need for ever-increasing growth as an addiction. Capitalism is intrinsically incapable of reforming itself. Greenwashing capitalism is not a solution. Joel Kovel  identifies capitalism as anti-ecological, indicting endless growth, overconsumption and exploitation of natural resources as the enemy of nature. Kovel explains the development of a social view of ecology, taking into account ethical positions with ecological content. He considers what acting ethically and ecologically implies, integrating all dimensions of ecology, leading to an ecosocialist viewpoint, which is environmentally, economically and socially just. De Angelis  explores the role of the commons and the transformation to post-capitalism. 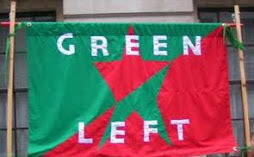 My analysis does not support the view that the Green Party response to the General Election last June should be a lurch to the right, moving from socialism to ‘ecologism’ and ditching so-called ‘left-wing populist’ policies. Such a flip-flop approach to politics would seriously damage the credibility of the Green Party. Whilst welcoming the present ascendancy of socialist policies in the Labour Party under Jeremy Corbyn’s leadership, there is no guarantee this is a permanent state, or how a future Labour government may perform. We do not know if or when Peak Corbyn will be reached. Labour is far from ecosocialist. Most Labour Party MP’s, many Labour councils, and much of the Labour Party organisation remain entrenched as ‘New Labour’. What’s wrong with ecologism? It fails to confront capitalism. It would be a backward step for the Green Party. IT IS POSSIBLE TO CONTINUE CAMPAIGNING FOR GREEN PARTY POLICIES WHILE ALSO WORKING FOR THE ELECTION OF A CORBYN LED GOVERNMENT. I believe it is possible to continue campaigning for Green Party policies while also working for the election of a Corbyn led government. In the former role, we are raising the profile of climate change issues and opening up questions about endless consumption and growth; and what constitutes social and economic wellbeing. In the latter role, we are pursuing the only realistic strategy – for a government that could gradually, under pressure from its membership and ourselves, move towards green policies. I find Momentum members, in my area, are overwhelmingly conscious of climate change issues, alongside opposition to wars and arms trading and a vision of a more equal sharing of resources within and among nations. "THE CARTHORSE, THE DINOSAURS AND THE RADIOACTIVE ELEPHANT"
No doubt many Greens will be saying: ‘About time too! How many hurricanes did it take to make you notice this?’. Understandable, but unfair, since, for a long time, awareness of climate change and environmental crisis has been building amongst Trade Unions. This is not surprising if you remember that many Unions’ members are already on the frontline in dealing with the consequences of climate change. Firemen and women, ambulance crews and many other workers in the emergency services cope with floods and their victims. Airport and transport workers, (and sometimes their families too), are consistently exposed to harmful pollutants such as diesel emissions. University, college and school teachers have continually tried to pass on the uncomfortable truths about our environmental crisis, which the powerful often seek to deny or ignore. In 2016 the Transport Salaried Staff Association (TSSA) was the main proposer of a TUC Climate Change Motion which perhaps went further than the 2017 motion in explicitly calling for an end to airport expansion. This was construed by some as a threat to jobs and the motion fell 75% against/25% for. Perhaps the 2017 success was a case of carrot being better than stick in moving the TUC carthorse. Continuing with the animal comparisons, even Unite and GMB, often seen as anti-Green dinosaurs, supported it, whilst not mentioning the radioactive elephant in the room (nuclear power) may have secured the support of the technical/managerial union, Prospect. So will the Greens now have to adapt the time honoured trot demo slogan and chant “TUC, GET OFF YOUR KNEES! CALL A CLIMATE CHANGE STRIKE!”? It could still be around today. Only then do we weep.